, 250 HP main or transfer box with 1 ¾” 20 splined input and output shafts. Two spindle gearboxes, 250 HP, base mounted, 1:1.6 ratio. 20 splined 1 3/4” input shaft, 2 3/8” output shaft on spindle boxes. All gearboxes have forged alloy steel malleable housings, carburized and hardened gears and shafts, tapered and ball bearing. Drive Shafts – Shielded PTO’s made from the finest quality propeller shaft material and needle bearing universal joints. Category 4 main input and side drives. Category 4 jack shaft for pull model. Category 4 80-degree constant velocity main drive shaft optional for pull model. Slip Clutch – Heavy-duty clutch with spring type adjustment and four friction discs on main shaft, outboard protection by means of shock absorbing rubber elements connected to splined yokes which form a coupler. Blades – 1/2” x 4” material, alloy spring steel, airlift design, free-swinging when encountering obstructions, 6 inch overlap for better cutting. Blade tip speed: 15,800 fpm. Wheels – Two solid rubber tires standard. Independent shock absorbing system for all wheel axles. Optional: aircraft tires or implement tires, dual axle arms (4 tires total). 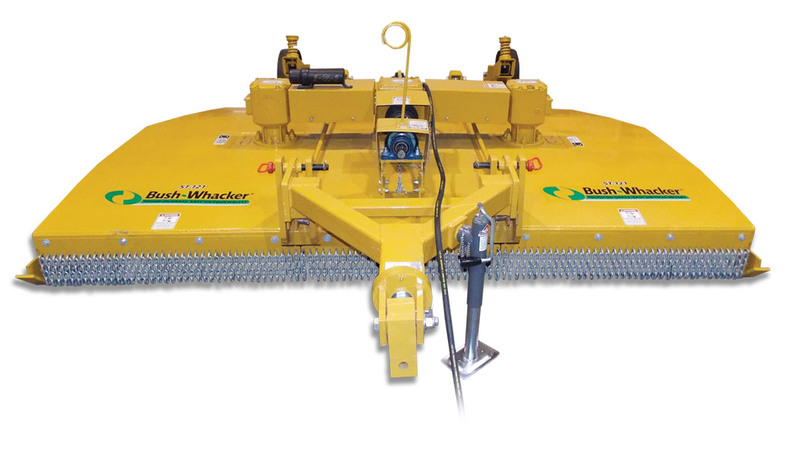 Bush-Whacker Special Deck – Bush-Whacker Special Deck includes a primary (bottom) deck of 7 gauge steel that is welded to heavy duty heavy tubing structures. 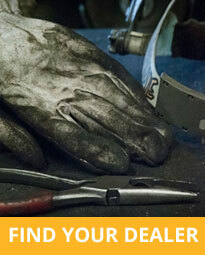 The smooth, easy-to-clean top deck is made of 12 gauge steel and protects the inner support frame. Combined deck thickness: .2921”. Hydraulic Adjustments – Hydraulic cylinder controls cutting and traveling height adjustments for pull and semi mount models (optional for lift model). Dimensions – Cutting width: 121 inches. Cutting height: adjustable from 2” to 15”. Axles adjustable from 24” centers to 40” centers for row crops. Overall width: 131”. Overall length: 140”. Transportation wide: 131”. Cutting height for aircraft and implement tires: 2” to 17”. Other Standard Features – Replaceable skid shoes. For pull model: heavy-duty tongue assembly with dual leveling rods, hydraulic hose holder, jack for easy hookup and unhooking from tractor. Structural frame of mower is 3” by 4” tubing with 7 gauge wall thickness. Gearboxes are mounted to 3/8” plates that are welded to the 7 gauge deck. 8-bolt mounting on gearboxes – heads are tack-welded to bottom of deck so one person can tighten the nuts or change the gearbox. Blades are 1/2” by 4” instead of traditional 1/2” by 3 1/2”. Weight 3,565 lbs. 2,741 lbs. 2,326 lbs. 2,915 lbs. 1,759 lbs.